IMO the problem with the layout here is that you see the stores in the hotel's 1/2 floor up, 1/2 floor down layout through the storefront windows, but there is no way to enter the stores directly from the sidewalk. You have to enter via an interior hallway to access the retail spaces. Sounds like the wheelchair code at work. I've never been inside this place, but I bet you go inside, then go up or down by stairs if you're on foot. Meanwhile --because ramps would gobble up valuable space-- wheelchairs probably use a semi-concealed wheelchair lift inside nearby. Entering the stores directly from outside is simply not an option; to do it legally would produce a monstrous tangle of circulation elements that would even more effectively obscure the storefronts. Yeah, from a design perspective, the ADA turned out to be pretty catastrophic to architecture and urban design. It's also a major reason why a lot of building owners allow their older properties to deteriorate rather than renovating them. I'm amazed there isn't much greater outcry over it, especially from architects. Tangled circulation results from intersection of developer?s desire for two levels of retail with accessibility code. Solution: interior-corridor access to retail spaces. Outcome: tenants who don?t mind being tucked away because they don?t rely on walk-in customers who impulse-buy. Result: little interaction with sidewalk provided or desired. These shops are not location-specific. They could be anywhere. I bet their customers mostly arrive in cars. The casualty: streetlevel relevance and experience to the folks in Kenmore Square. You can see the city die a little bit. Huh? Have you been to the same kenmroe square as I have? There's nothing hidden about these retail locations. Hidden would be the fed ex by the mcdonalds. And if arrive by cars, you mean hotel guests arriving from the airport in cabs, then yes. ^ "Tucked away", not "hidden." No direct sidewalk access. Some of those shops are specialized enough so they could't survive on walk-in traffic alone. Jass, you're much more familiar with today's Kenmore Square than I am. Would you say the Hotel Commonwealth's mall contributes much to the retail needs of the Kenmore Square pedestrian community --particularly compared with what was there before? I'm in Kenmore a few times a week, and occasionally eat at Eastern Standard. The only other time I was inside was to tour the carnage at opening (and because I was invited, not because it's inviting). One of the worst designs I've ever seen built. You can blame ADA and the developer as much as the architect. Actually, truth is, the most important design decisions are rarely made by the architect. I've always been baffled by this forums dislike for the building. I actually was not familiar with Kenmore before the construction of the hotel had started, but comparing the building with whats next door - towards the mcdonalds -makes me appreciate it so much. I think the retail is more visible than many shops on newbury because of the large window space allocated with each one, allowing for larger signs. I doubt anybody is ever confused as to how to enter the shops. The area in front of the shops is also very successful. The wide sidewalk, the partition between sidewalk space (brick) and retail expansion (seats for restaurants, place for books) works well, much better than many other recent buildings. Do the shops contribute to the areas retail needs? Well no, but thats because theyre all so specialized, with the exception of citizens bank. However, would something like cvs really be better? No way. They have to be because they're not right off the sidewalk, and so they're not dependent on impulse. They're destinations, and going to one is an expedition. I bet some folks mount expeditions from Waltham to some of these shops. You just know they arrive by car. The buildings on site were not upmarket. They were somewhat ramshackle and catered to students and locals. Their biggest virtue was that they were multifarious --not one building. Small footprints, intimate scale, a sense of bustle. All the things we like about good streetscape. Could they have been better? You bet. Just not the way things were actually done. A CVS would at least serve the community. I've had lively discussions with those who believe the space is a success. In a vacuum, it perhaps is, but I don't live in a vacuum, I live in reality. The only thing the community gained by this redevelopment was a flat sidewalk. The facade is cold and sterile, "designed" on a computer in a vacuum and then dressed up after the community screamed "hell no." This compromise is the result, and it's falls far short of what could have been. I suppose viewing the building without knowing what was there before makes it easier to accept mediocrity. Would flying stairways a la Newbury - in addition to the disabled access inside the building - have violated the ADA? I doubt it - we're not living in the "Harrison Bergeron" society Vonnegut feared. I think the choice to sequester the second story retail was based on some other factor. You claim that the retail types is a result of the way the stores are set up. I dont think that makes sense. The super-specialized, high priced retail is because BU/Hotel Commonwealth wants snazzy stores in a place that charged 500$ a night, and these expensive stores want to be were super-rich customers are. Look at the new Mandarin oriental retail, all super-specialized, highly expensive. Its the same deal, its not because of the entrance to their outlets. Theres is no parking in kenmore square, where do these walthamites park? Kenmore square is not a destination, nor are the stores. They exist, and dont go out of business because there are enough hotel guests in the area + high traffic thanks to the crossroads nature of kenmore square. Again, the buildings next to the hotel are "not one building. Small footprints, intimate scale, a sense of bustle. " yet they're terrible. If someone offered to demolish everything from 7-11 to citizens bank and replace it with hotel commonwealth II, Id super-excited about how kenmore square is being made less of a dump. incidentally, anyone have the original renderings to the hotel? I dont remember them. It's not hard to comply with the ADA without changing much; simply add a back entry at the ground (half-basement) floor with elevator to the 1st floor. Some are giving the ADA too much credit, and I'd like pics of the Hotel Commenwealth before the redesign, right now, because I haven't seen what was before, I don't see anything wrong with it at all. After a few looks at the building, I can see that it's relatively new, but it blends in inoffensively and a modern facade of the size Hotel Commenwealth is would have looked grossly out-of-place. Kenmore is still a dump, but that's because of the MBTA; after the station is finally done (and hopefully Fenway Center), we'll see how good of a space Kenmore would be. Some may prefer the old gritty Kenmore over anything, but I'd say most would like the cleaner, modern, yet still vibrant new Kenmore, and besides, there's still plenty of gritty places in the city, but oddly enough those who profess to like grit in this instance call it a "dump" in other instances where it doesn't fit their pessimistic portrayal of Boston (i.e. Chinatown). Theres is no parking in kenmore square, where do these walthamites park? Kenmore square is not a destination, nor are the stores. 90 minute complimentary valet parking offered! Hunt?s New England?s largest supplier of photographic, video, digital imaging equipment and accessories. Custom fit jeans and accessories tailored on site. Panopticon Gallery of Photography is one of the twelve oldest galleries in the United States dedicated to showing fine art photography. Panopticon exhibits local contemporary work in addition to photography from around the United States and Europe. Panopticon Gallery also specializes in producing and selling contemporary archival reproduction photographs from noted historical collections of photographs from around the world. In the Hotel Commonwealth you may find and image you fall in love with, and take it with you, or utilize their shipping services. Books, postcards, and posters are for sale. As a luxury lifestyle boutique, Persona Jewelry+ blends fashion forward pieces with those that are timeless and classically elegant. Featuring the work of local, national and international designers chosen for their one-of-a-kind craftsmanship, Persona has the ability to fashion a range of personal styles. On-site jewelry design makes Persona a rare gem in the city as clients can participate in the custom design process as much or as little as they please. From engagement rings to causal pendants, jeweler and co-owner Gary Shteyman can create something exclusively for you. In addition to the diverse collection of jewelry, Persona features designer handbags and novelty gift items. Find the richness in what makes Persona a true treasure in this historic city. Unique luxury car rental featuring Mercedes, Jaguar, Porsche, at market prices. Gourmet wine and food shop. Offers the true designer and original perfume oil mix of every commercial perfume for men and women. Can't do that, back entries for the disabled are considered discriminatory in new construction. Doesn't matter that the many are affected, the few can not be faced with anything which could potentially treat them as second class citizens. ^^^^ Yeah, and if it weren't for that pesky Civil Rights Act, I could keep the "few" from disrupting the fun of the "many" in Downtown Crossing. > A CVS would at least serve the community. And this block used to have one, before it was demolished to build the Hotel Commonwealth. For all the faults of the Mandarin's use of physical accoutrements (i.e. the bland stone in the streetwall), it is a major success in circulation. Plenty of doors, plenty of windows, plenty of opportunities for those inclined to walk inside to do just that. And, plenty of places for the drivers to drive to. 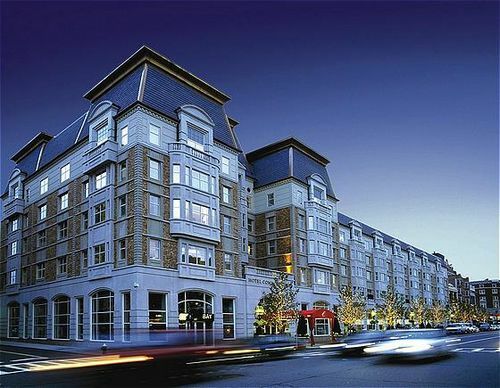 When it became obvious that the split-level, "Newbury" style shopping experience was not going to work, Hotel Commonwealth should have reverted to a Mandarin-style street experience. Instead, intent on maximizing retail, they tried to do it anyway. So, the Mandarin fails on pretty, but wins on usability. Hotel Commonwealth fails on pretty and usability. 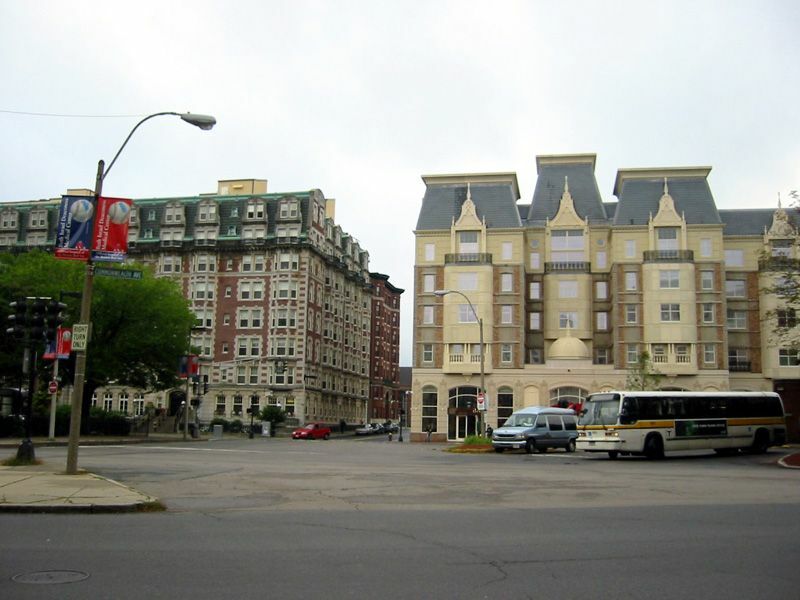 For all of you who weren't around before Hotel Commonwealth, here is a link to a picture of the Kenmore Sq. pre Hotel Commonweath. Not a very big picture but the best I could find doing a quick Google search. The hotel consolidated many smaller buildings, as has happened elsewhere in the Back Bay/Fenway area, e.g., Boylston Street between South Charles and Arlington, Boylston St. between Berkeley and Clarendon, and hopefully not soon to be Boylston between Arlington and Berkeley with Druker's proposal. Also, hopefully Berkeley College of Music does not wish to consolidate the multiple small footprint buildings lining Boylston Street between Mass Ave to the Fenway. A smaller consolidation occurred a few years ago preceding Emerson College's construction of a dorm mid-block on Boylston between Tremont and South Charles. Last edited by commuter guy; 10-26-2008 at 10:59 PM.